Chobe National Park, in northern Botswana, has one of the largest concentrations of game in Africa. The Serondela area (or Chobe riverfront), situated in the extreme Northeast of the park, has as its main geographical features lush floodplains and dense woodland of mahogany, teak and other hardwoods now largely reduced by heavy elephant pressure. The Chobe, which flows along the Northeast border of the park, is a major watering spot, especially in the dry season (May through October) for large breeding herds of elephants, as well as families of giraffe, sable and cape buffalo. The flood plains are the only place in Botswana where the puku antelope can be seen. Birding is also excellent here. Large numbers of carmine bee eaters are spotted in season. When in flood spoonbills, ibis, various species of stork, duck and other waterfowl flock to the area. This is probably the most visited park section, partly because of its proximity to the Victoria Falls.The town of Kasane, situated just downstream, is the most important town of the region and serves as northern entrance to the park. The Serondela is my all-time favourite wilderness area. I attempt to visit at least twice a year. 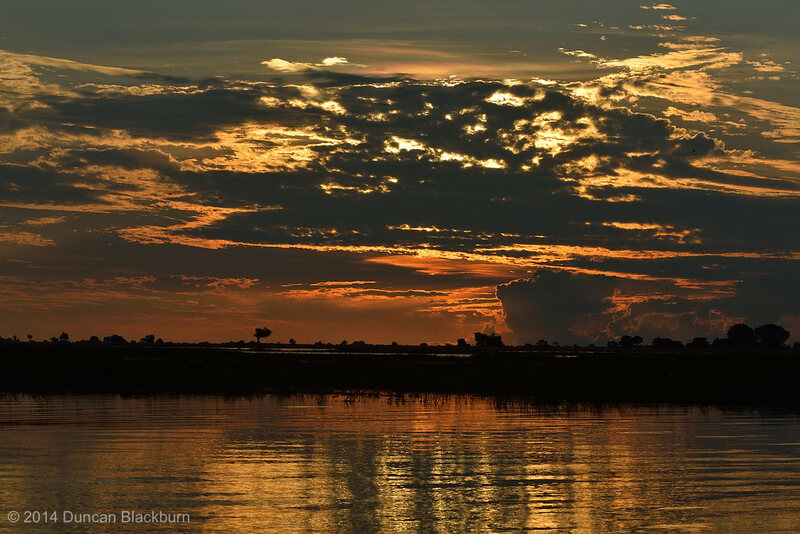 This image was captured near the town of Kasane, northern Botswana.